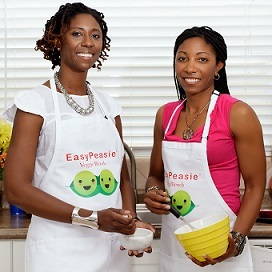 Jamelah Tucker and Dorielle Price, co-founders of EasyPeasie Veggie Blends, are sisters with a new approach to an old question. They have solved the riddle of how to get a toddler to eat vegetables. "When I was caring for my sister's children while she returned to work, we learned that toddlers' diets are related to what they're exposed to early in life," Tucker said. "Research makes apparent that babies palates are being warmed to flavors from as early as in utero. With that in mind, we wanted to give the children exposure to the flavor of vegetables as early as possible. That’s how we came up with the idea." EasyPeasie makes a dried vegetable product that helps picky eaters learn to love vegetables. "Children need repeated exposure to a flavor before accepting it oftentimes," Tucker explained. "We've figured out through experimenting that if we dry them into a powder, then the flavor is milder but maintained enough so children get used to it. We're priming their palette for veggies by mixing it in with whatever they're eating." "It's like a seasoning you can sprinkle on top or add while cooking," Price added. "We don't use artificial flavors or colors. It's not a supplement or vitamin. There's no added sugar. It's an all-natural vegetable palate primer. There is no other product on the market to introduce the flavor of vegetables to children." The pair's advice for aspiring entrepreneurs is to be methodical and seek assistance along the way. "Break up your goal into small, achievable tasks so you don't get overwhelmed and discouraged," Price said. "Take small steps toward your goal every day. Also, surround yourself with positive motivators who will give you honest, helpful feedback."